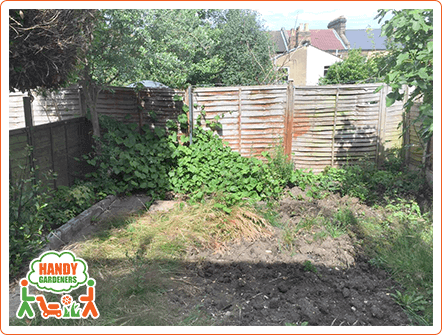 We’ve received a call from a family living in New Cross whose garden needed a full transformation, as it has been neglected for quite some time. 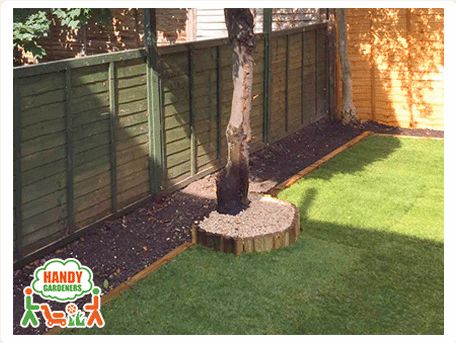 The client was determined to transform his garden and gave us his ideas and we pieced them together. The outdoor area was relatively small but our head landscaper who did the viewing, mapped out a plan for landscaping jobs to be executed in order to have it looking shipshape. After the price estimation was given, the clients agreed to it and an appointment for the job execution was set. It took 3 days for our gardening team to accomplish the landscaping jobs that included old patio strip clearance, leveling and soil rotavation, new top quality natural turf lying on a 32 sq meters area, cleared the old patio slabs and the old turf and installed a new wooden fence for the perfect finish of the garden. Step 1. 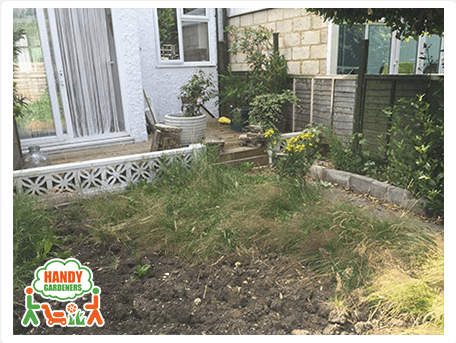 The landscapers performed a viewing at the property, they took all the necessary measurements, they took a good look at the area, discussed the client’s ideas, chose the right type of materials in order for this garden makeover to be started. Step 2. After everything from step 1 had been done, the actual landscaping job was started on the appointed day. 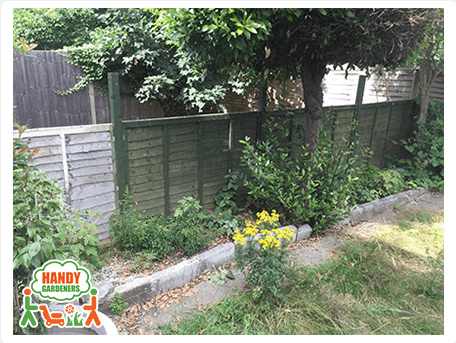 The garden was full of weeds and looking untidy and overgrown, the fence was in a bad state, so the first thing our gardeners had to do was clearing the old patio strip, de-weeding and green waste collection, so that the area could be ready for the new look. Step 3. 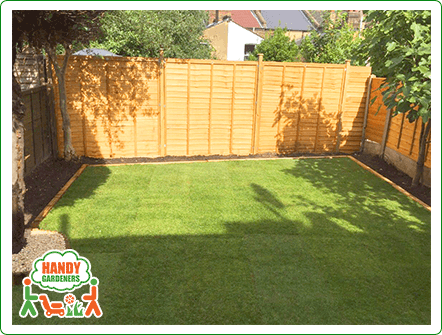 Proper preparation of the ground is the key when installing a new lawn, so it followed double digging of the soil, leveling, removing of old patio slabs and disassembling of a fence. After that our team started rotovating the soil, so that it can be freshened up and prepared for the new turf laying. Step 4. Landscaping the new project garden to laying new turf was the next step. 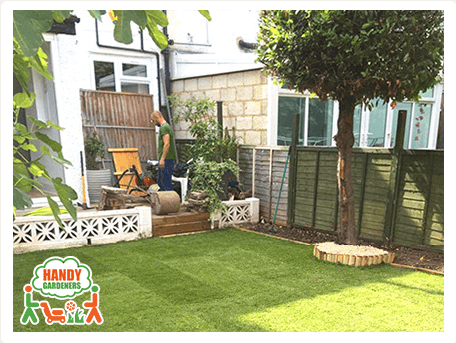 The new high quality natural turf was placed on the leveled area carefully, as prior to that was cut exactly to the shape of the lawn and around the area planned for building of garden beds. Step 5. 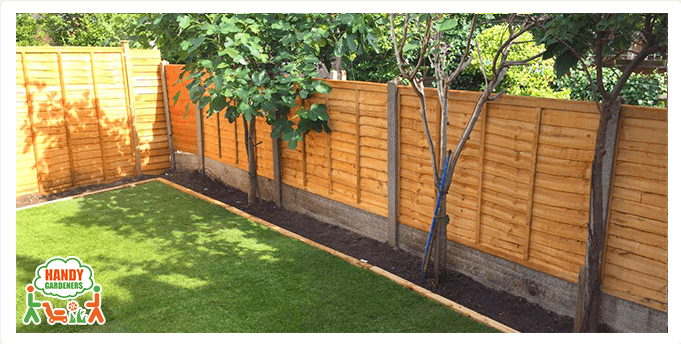 Flower beds were designed and installed, as well as new wooden fence posts and panels were built up and screwed up to the new posts. Expert advice on immediate and long term aftercare was given to the client. Step 6. Once the work in the garden was completed and the lawn was laid, it was literally inviting you to sit over there and have a lunch outside. The client was wondering how come he waited until now to have this miracle happen to him. All of this was completed within 3 days of hard work. The final result was stunning as it is clear from the pictures attached. 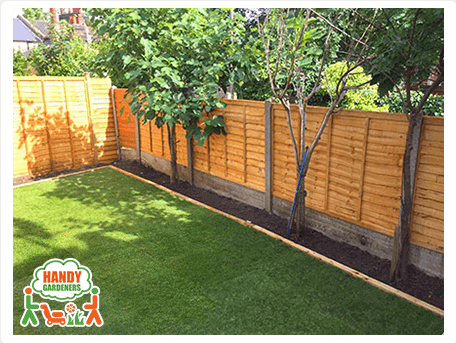 If you are dreaming about a beautiful yard, like you have seen in the movies, do not hesitate to give Handy Gardeners a chance to make your dreams come true!